Hardscape projects, such as patios, walkways and retaining walls can increase your home's value by creating more usable area. When combined with landscape installations - the selective plantings that add texture and beauty to your landscape - they increase and improve your outdoor living experience. Walkways - guide movement leading to your front door and make it a welcoming focal point; winding garden paths with pavers, blue stone, natural flagstone, cobblestones, or patterns enhance the property and highlight your garden. Patios - add outdoor living area with usable square footage and create a green-living outdoor room. Patios provide a place to relax, gather and grill; a place to share with your guests while adding charm and character to your home. Patios vary in size and shape. We provide the consultation you need to help you make decisions on size, style, shape and material. It’s important to get the most out of your property and create a place of enjoyment. 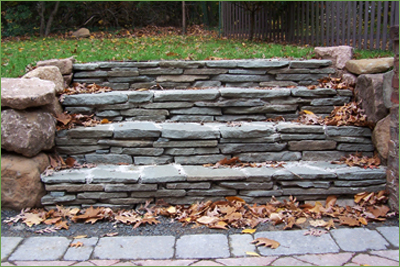 Retaining Walls - functional for hill retaining and terracing, from simple planter that can incorporate steps and landings or transition a slope to a usable and beautiful space. Retaining walls give you added space that you wouldn’t normally have and include many options, especially material selection. Steps - A new stepped walkway to your front door can compliment your home and provide improved and safer access. We offer consulting to assist with the design and materials, handling the work from start to finish for a seamless and professional step installation. Whether rebuilding or refacing steps to your home, buildings, or landscape areas and structures, adding new steps, we're happy to share design consultations in advance of the project.